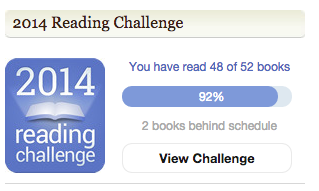 I've read 46 books this year. Don't be fooled by my GR ticker—two of those 48 are short stories that I read this year and wanted to rate, but I don't actually count them toward my 52 book goal count. That means (as of this posting) I have 11 days to read six books. Originally, I was thinking I might trim down my goal number to 50, but that still leaves four. That's a book every three days while I'm on my vacation, and, honestly, I just don't see that happening. If you've been reading since I first began blogging last month, you might have gleaned by now that I tend to be pretty hard on myself. I'm an equal opportunity self-deprecator—I'll guilt myself over mishaps at work, late reviews, failures in the kitchen, awkward social interactions and, now, unmet reading goals. I think my dedication to lifelong learning and improvement is both my best and worst quality—I'm ambitious and like to get a lot done, both personally and professionally, but I'm also slow to forgive myself when I don't immediately succeed. And the truth is, I have been reading. A lot. Possibly to the detriment of other things I enjoy—my cat, my boyfriend, my friends, other hobbies, even my mental health. I've been so focused on kicking off my blog successfully by getting new content up every day, and making sure I'm reading at a steady pace, that a lot of other things have fallen by the wayside. Don't get me wrong—I really love blogging, and I love the community of book bloggers that I'm only just beginning to get to know. I just have to remember that I love other things, too, and that my love for this won't last if I'm tearing my hair out over being four (or six) books short. My advice for a newbie ~ there is no fail!! Having fun is what matters most, and you're lucky to have a life that's full that you can't read every second of every day. So if you don't beat your goals, that's ok, as long as you have fun. In addition to BoB, this seems like great advice for reading and blogging in general. It was also a wonderful reminder for me that I really do have a full life, and it's important to enjoy it. So! I'll continue to try to get content up every day, but if not, that's OK, too. I'll keep on reading, but if I don't touch my stack for a day (or two, gasp! ), I'll try not to worry. Instead, I'll do my best and try (try, try) to remember that that's all I really have to do. I'm not going to make my goal this year, either (for the first time in four years). But I think I realized that if I keep upping it every year there has to be a point that I won't be able to get it...it just happened to be this year. I'm reading a ton of books, I can't be stressed or frustrated by it. My light, fun recommendation is always Where'd You Go, Bernadette? by Maria Semple. If you haven't read it yet, it's vacation perfection. Thanks so much for dropping by! That's a good point about the fact that it would just continue to grow, and continue to become that much more difficult to achieve. Thanks for the rec! Unfortunately, I think I've missed my window for getting to the library before my trip, but I will definitely check this one out in the new year. Ahhhh, I'm glad you liked what I said, and I hope you are able to remember it, when you get stressed out. I mean, look at you. You are going on vacation again. If I remember, you were just on one at Thanksgiving time, so you are soooooo blessed!! I haven't been on a trip in almost 8 years, with none in sight. So, while I'm lucky to get a lot of reading time, I'd much rather have a full and exciting life! Try to be content with what you have and can do, cuz you never know when those things can change! Escape from Lemoncello's Library by Chris Grabenstein ~ a middle grade read about a scavenger hunt in a library. Hover Car Racer by Matthew Reilly ~ another young/middle grade book about a young hover car race, a real feel good book. Redshirts by John Scalzi ~ if you are a Star Trek fan. Dash & Lily's Book of Dares by Rachel Cohen ~ a cute YA scavenger hunt type thing. Kingdom Keepers by Ridley Pearson ~ great Disney fun, fighting forces of evil in the parks. Robyn Carr ~ Virgin Rivers series ~ light, good romantic & romantic suspense series. Ready Player One by Ernest Cline ~ virtual reality scavenger hunt with 80s references. And awesome that you got Shadow of the Wind! I hope you like it!! I recommended it to two people. My friend didn't like it, but my hubby loved it as much as I did. You're so right! You do remember correctly about Thanksgiving. :) At the risk of sounding spoiled (I'm lucky to have gotten two trips! ), my last one was full of travel and events and, while super fun, I'll be glad for the downtime that this one will bring. I'll be sure to write a review once I'm through TSotW! It looks like a really fun read. Karsyn's a smart lady. That's definitely the way to go -- keep it low stress. I'm one to always overextend myself. I haven't quite figured out the right way to balance all of the things I take on. It's just a continuous learning curve. One of these days I'll approach life the way Karsyn does and stop stressing the crap out of myself. I marvel at the number of things you accomplish! Your Christmas project posts alone had me in a vicarious tizzy. :) You must have mad time management skills.